Three goals in the final 15 minutes overcame a battling Clyde and put Motherwell through to the last 16 of the Betfred Cup. Trailing 1-0 at half-time to a David Goodwillie goal, last season's beaten finalists had their work cut out to avoid an early exit. But two goals in two minutes from Curtis Main and Danny Johnson turned the tide before Conor Sammon added a late third. Over the piece Motherwell did deserve to win, but the manner of the defeat was harsh on Danny Lennon's side. Motherwell began the brighter and had a number of early efforts at the home goal. But strikes from Sammon, Andy Rose and Main strikes were all off target, each further over the bar than the last. Elliot Frear was the most likely source of inspiration for Stephen Robinson's men. One run and cross set up a chance for Main who couldn't direct his header on target; another ended with a low shot which the diving Kieran Hughes did well to turn round the post. The Fir Parkers were forced into an early change, Carl McHugh picking up a knock and being replaced by Liam Donnelly on 19 minutes. Clyde were content to try to hit on the break with David Goodwillie stretching the Well defence at every opportunity, well supported by Jack Boyle. 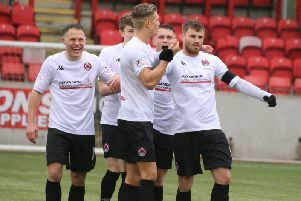 Danny Lennon's side were gradually working their way into the game and looked threatening on 31 minutes when Kevin Nicoll sent John Rankin clear down the left. But the veteran midfielder took too long to deliver the final ball and the chance was lost. However less than a minute later the League Two side were in front as Goodwillie twisted and turned his way past the Well defence, outmuscled Peter Hartley and fired low past Trevor Carson. After growing their way into the game, Clyde were now giving as good as they were getting, with Goodwillie a constant threat on the counter attack. It remained 1-0 at the break, and although Well replaced Alan Campbell with Alex Rodriguez Gorrin on for Campbell it was the home side who began the second half the brighter. Well had their work cut out and Robinson made his final change on 59 minutes, defender Tait making way for striker Johnson. But they could have been further behind a couple of minutes later as Goodwillie again got free inside the box only to fire wide of the far post. Fitness was always likely to be a factor in the closing stages and the Clyde defence had to deal with a number of dangerous balls into their box. But they were still a threat on the counter and Barry Cuddihy found sub Ally Love in space with a great ball to the far post, but the Clyde man failed to make contact. The home side paid a heavy price for failing to take advantage of that opportunity. Just a minute later Main got the final touch to a scrambled equaliser after Clyde failed to clear Rodriguez Gorrin's corner. And two minutes after that Johnson collected a Frear cross and smashed the ball into the roof of the net to put the Fir Parkers ahead. Main was just over with a spectacular effort from a Sammon cross before Clyde missed a glorious 89th minute chance to level, Eddie Ferns electing to try, in vain, to find a team-mate instead of shooting after bursting into the Well box. And a minute later it was all over as Sammon headed in off the post from a pinpoint cross from Well star man Frear.